For most small-medium sized businesses, outsourcing IT has become a standard procedure for many different reasons. The fact that it is more reliable and cost-effective are the first reasons that spring to mind when debating whether or not to hire your own in-house IT staff. Perhaps the most important thing when considering outsourcing your IT is that you need a company that'll grow with your business as a ‘one-size fits all’ IT provider does not exist. 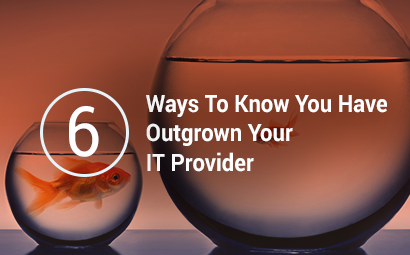 A growing business will eventually reach the point where it becomes too large for its current IT support provider but how will you know? It usually takes business owners and managers a while to realise that the business requires a new IT Partner, one which reflects your level of business. A disparate relationship could start affecting your business productivity or even worse your bottom line. If your provider hasn't upgraded your infrastructure in years or if they do not have a dedicated 'Account Manager' to have these frank conversations with then that's one red flag. A mature IT provider would help you handle the budgeting and planning of new tech and advise solutions which match the needs discussed in your quarterly meetings. If you don't have quarterly meetings, this is discussed further down the list. With an increase in cybercrime, software and hardware providers are releasing updates more frequently than ever. These updates fix bugs and patch any security loopholes, without which, your whole business is left exposed to vulnerabilities. One of the biggest software and hardware updates coming up is the 2020 Windows 7 End-of-Life. Has your IT partner made you aware of this? Or have they helped you budget for potentially one of the biggest infrastructure refreshes in the last 5 years? An effective IT provider is able to foresee and take control of a situation before it happens or becomes apparent to an end-user rather than merely responding to an issue you have brought to their attention. If this is all you know then you might not even realise what you've been missing out on. Ad-hoc fixes make it easy to lose sight of the bigger picture. They also rack up your service bill instead of helping you control IT costs. SME's are cybercriminals’ prime targets as you can often assume that they have inadequate security. On the opposite spectrum, SME owners believe they are too small to be targeted so they can't justify any expenditure in this area. However, when you outsource your IT it should come as an expectation of them to constantly be reviewing your infrastructure, taking this level of risk off your hands so you can focus on other areas of the business. Having regular touchpoints with your IT provider, both physical and non-physical is a good indicator of the quality of support. Whether this be through your meetings with your account manager, marketing (E.g. Newsletters, client events or charity initiatives), or even an engineer coming to fix an issue, having multiple avenues of communication enhances the relationship from being your 'IT provider' to being your 'IT partner'. Your relationship with your IT provider should be that of a partnership. An effective IT company will mould to your business needs and be flexible enough to match your level of growth no matter what. If your existing provider matches any of the above then it may be your time to move on. When choosing an IT provider, look if they can guarantee consistently responsive services, focuses on communications, provides transparent billing, and has the expertise to support your network. Making these comparisons is even easier with our 'IT Support checklist which you can download below or by clicking here. How do You go About Changing IT Providers? What to think about when choosing IT Support? Why a technology business review is vital?